What is an Alcohol Awareness Class Certificate of Completion? Our online alcohol and drug awareness or minor in possession certificate of completion is commonly used for court, legal, occupational and school requirements. It comes on a standard form which includes both the customers relevant information as well as our identifying information and credentials. 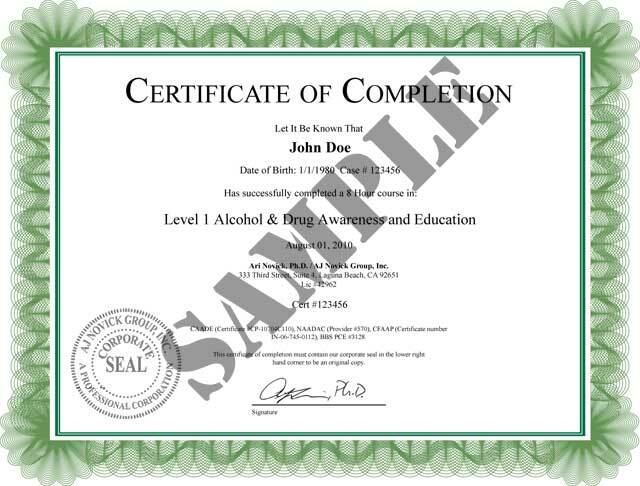 The certificate of completion of our alcohol awareness class or minor in possession class is an important document because it shows your successful completion of our program and your requirement. We always send out an original signed copy, but an electronic version is also available upon request.